- Extended, Sturdy, reinforced, adjustable and detachable shoulder straps. 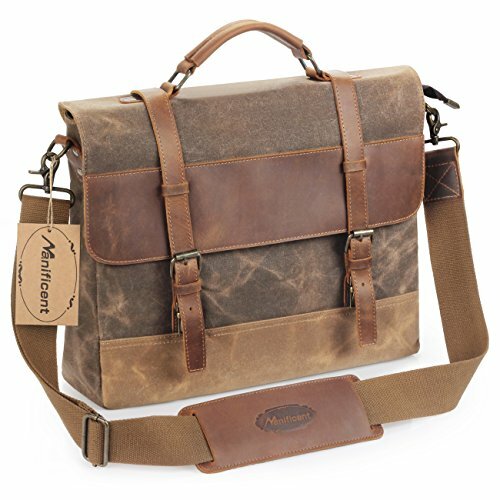 - Made of superior top cowhide ,a durable rugged heavy canvas fabric and sturdy hardware. - Geuine Thick Leather handle,detach the strap to be a professional business briefcase.Really conveneintly carry it around in 2 ways. - Solid and sturdy zippers featuring leather zipper puller to help you have a firm grip. - Double secured by insert buckle and zippers that lead you a quick access into the pockets. - 1 x main compartment with zipper. Keep laptop, tablet , documents, books more secure. - 1 x inner pocket with zipper. Keep passport. - 2 x inner slip pockets for pen. - 2 x bigger pockets for phone/card holder/small gadgets. - Messenger bag:16.5"x 13"x 1.96" (Lx H x W). - 1.Apply cream or moisture lotion onto the leather surface,and use a soft cloth to complete the upkeep. .
- 2.Avoid cleaning products with alcohol, turpentine or other mineral spirits as they will discolor and dry out leather. - 3.You could use hair dryer to smooth it if you do not wanna the leather surface have disorderly wrinkles, scars, scratches. If you have any questions about this product by Manificent, contact us by completing and submitting the form below. If you are looking for a specif part number, please include it with your message.